GENT, Belgium (VN) — Think the pre-Tour of Flanders pressure is getting to Wout van Aert? On Friday afternoon, van Aert sat before a group of Dutch, Flemish, and American journalists and fielded questions about Sunday’s Tour of Flanders. What did he think about the course? Could his Jumbo-Visma team overcome Deceuninck-Quick-Step’s numbers and experience? Where did he plan to attack? When asked whether the stress and media hype around his Flanders attempt was greater than that during his cyclocross campaigns, van Aert smiled. 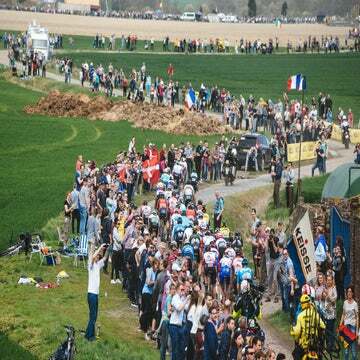 In fact, van Aert was adamant that cyclocross created a more pressure-filled environment that the Tour of Flanders, which he first raced last season, finishing ninth. 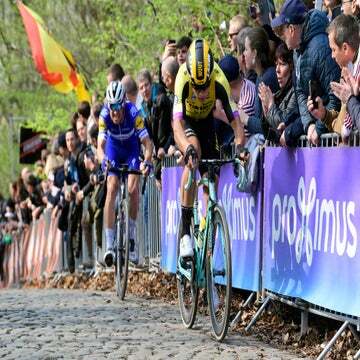 A three-time world cyclocross champion, van Aert said even cyclocross’s racing format generated more stress. Van Aert’s laid-back attitude may help him block out the expectations that have quickly been lumped on his shoulders. At 24, he has become the new darling of Belgian road cycling over the past month, due to his impressive results at the early-season classics. His near-miss at E3 BinckBank Classic generated national praise — he outsprinted Flemish cycling hero Greg Van Avermaet (CCC Team). At the finish line in Harelbeke, van Aert was swarmed by a massive number of photographers and television cameras. Van Aert’s image then appeared prominently on national newspapers, alongside stories praising his strong form. His strong form comes as other Belgian stars — Philippe Gilbert (Deceuninck-Quick-Step) and Oliver Naesen (Ag2r La Mondiale) appear to be battling illness. Yet van Aert shrugged off comments that he had become Belgium’s best hope to win the race. “Actually I didn’t think about being Belgium’s hope,” van Aert said. “I think it’s about my own and the team’s ambitions that are important. Van Aert acknowledged his place on the short list of favorites and said that he has greater ambitions for Sunday than he did a year ago when he made his Flanders debut. Whether van Aert finds himself in a position to win could depend on his Jumbo-Visma team. Throughout this cobbled classics season, Jumbo-Visma has emerged as one of the strongest in the bunch. During Gent-Wevelgem, Jumbo-Visma placed its riders in all of the early breakaways, and placed three riders — van Aert included — in a 20-man break that got away early. The team also seized control of the peloton throughout the middle section of the race, helping split the group up in the gusting crosswinds. Nico Verhoeven, the team’s sport director, said they plan for similarly aggressive tactics on Sunday. Whether those tactics deliver van Aert into the final move is yet to be seen. Van Aert is confident he has the legs to ride into the winning selection of riders on Sunday. When asked if he plans to attack, or wait for the sprint, van Aert played it safe.